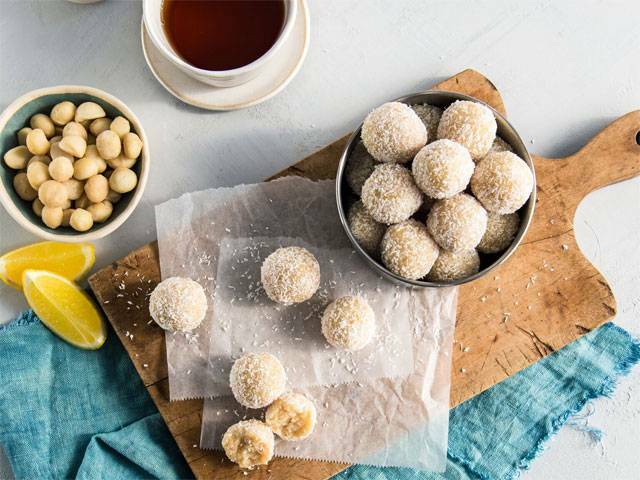 In a food processor, blitz macadamias to a rough puree. Add lemon zest and 1 cup coconut, and pulse to combine. Add lemon juice, vanilla, syrup, coconut oil and salt to macadamia mixture. Pulse until well mixed, refrigerate 1 hour or until firm enough to roll. Use a tablespoon measure to scoop balls, roll to smooth then toss in extra coconut. Store in refrigerator or freezer. Tip: You can omit the coconut oil, or replace it with 2 tablespoons almond meal, for a softer ball.